You may often hear the terms “website analytics” or “site statistics” and wonder what exactly these terms refer to, and why they would useful to you and your business. Before we delve into what makes analytics important, let’s define what they actually are. What they did once they landed there. There are many different applications that offer website analytics. For example, at Yola we provide Site Traffic data (the number of people that have visited your website) over the past 7 days on a Free account and for the last 30 days on a Silver or Gold account. If you need more insight about your audience, both SiteWit and Google Analytics offer free analytics, giving you in depth information about your website traffic. What information does website analytics provide? When looking at your site data, it is likely that you’ll come across terms that you’re not familiar with. We’ve put together this post which gives you the key definitions for the main terms. How should I use analytics? 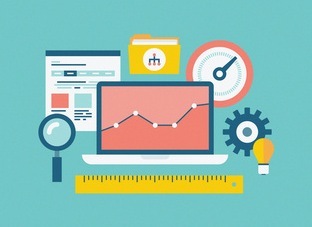 Analytics tools give you huge amounts of data about your website which can often be overwhelming. Before you start looking at all the information offered, first decide what the goal of your website is. This allows you to focus your attention on the most important data. To give a couple of examples, the main goal of an online retailer selling jewelry is to make sales via website. This goal is completely different to that of a consultant who is using their website to give information about their business. The online retailer is likely to be more concerned with conversion metrics such as number of purchases made online, whereas the consultant is probably going to be looking at engagement metrics, such as time spent on site and number of pages visited. Once you’ve decided on the main metrics to track, you can set up scheduled reports to be emailed to you within a specific time frame. This will remind you to regularly check your website data, so you are aware of any anomalies taking place. If you have a business with seasonal variation, it may be worth creating year-on-year reports, allowing you to compare the current month to the same month the previous year. In the case of the consultant, where communicating legitimacy to visitors is important, you could test to see whether adding client testimonials or industry expert endorsements that improve the credibility of your site have a positive effect on the engagement metrics. To put it simply, analytics provide information to help you make educated changes to your site based on actual data, as opposed to hypothesized ideas based on opinions. Analytics are also extremely important in helping you to understand which promotion techniques work well for your website. If you have invested recently in a new form of advertising such as Paid Search, you will easily be able to see how many visitors it has driven to your website, and whether those users are your ideal audience and are likely to achieve your website goal. Finally, analytics can be extremely useful in helping you find things that are broken on your website. If for example you notice a 100% drop off in a customer path, you can check to see if a page is down. Likewise, if you consistently get a certain amount of visitors via a certain source and that stops, there could be an issue with the link that refers traffic to you – but that’s another blog post entirely. Website analytics provide you with extremely helpful data, which if interpreted correctly and acted upon, could mean great improvements to the performance of your website. Tell us, have you made any changes to your website based on analytical data that have improved your website’s performance?